Mexico, like its northern neighbor, is a melting pot. Its cuisine is a mélange of many foreign influences. Certain dishes, like the torta the legacy of the Italian panino, were adapted to Mexican tastes. Another, tacos al pastor, which translates as “Shepherd’s tacos,” is now a quintessential Mexico City food. Its history is vague. Some say Lebanese immigrants brought their shawarma to nearby Puebla in the 1930s and the Middle Eastern method of cooking seasoned lamb on an upright spit, which evolved from the Turkish doner kebab, morphed into an essentially Mexican foodstuff. (Tacos arabes are still to be found.) Others claim the introduction was later, in the ’50s, and the setting was the capital. Regardless, it is agreed that lamb was first used in the tacos, but because Mexico is not a lamb-eating society, pork was substituted and condiments were added to suit Mexican tastes. To make tacos al pastor, sliced, pounded strips of pork are marinated in fruit juice, chili and spices such as cumin, achiote and oregano, then stacked on an upright skewer and grilled, manually turned from time to time. The recipes vary from stand to stand — proprietors are loath to give away their secrets. 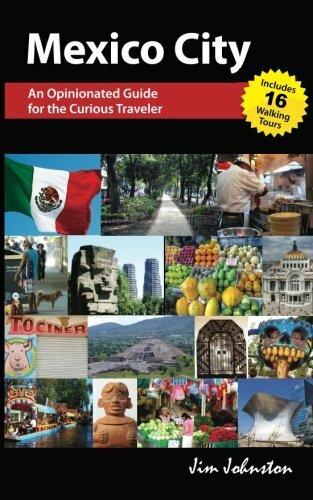 Because the special grill and spit are necessary to make the dish, no one in Mexico sees fit — or is logistically able — to make it at home and tacos al pastor are almost always found in street stands or fondas. 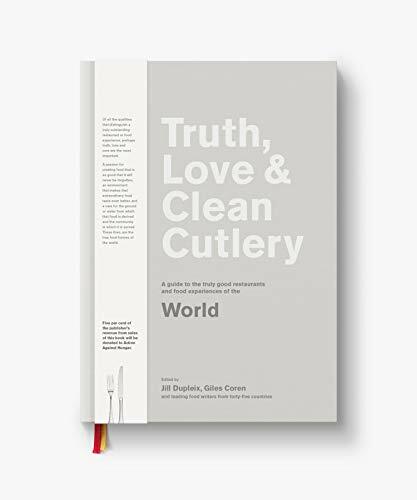 True recipes are thus hard to come by. Restaurateur Martha Chapa (of the acclaimed Dulce Pátria in Mexico City) provides an intriguing home adaptation in Los Tacos de México that includes pineapple vinegar and fresh juice, guajillo and ancho chilies, garlic, onion and cilantro. Chicago-based Rick Bayless’ recipe features achiote (sometimes called annatto, it’s extracted from the seeds of the red spiny achiote fruit) that colors the marinade red, as well as canned chipotle chilies. While at home the meat would be cooked over an open grill, in professional venues the vertical apparatus is topped by a hunk of pineapple and onion which render their sweet juices. The meat is sliced off by the pastorero, (a tacos al pastor maker) and served as an open taco on a small soft corn tortilla. A sliver of the pineapple, chopped cilantro, onion and a dollop of drippings top it off. Diners augment with lime and salsa to taste. One of my favorite places to eat tacos al pastor is El Huequito (which means “the little hole”), a tiny operation in this city’s Centro Histórico, founded in 1959 and among the first places in the city to serve tacos al pastor. At El Huequito the sliced meat is bathed in a moderately picante salsa of chile de árbol, enhanced with chopped onion and cilantro and rolled up in its small tortilla. Several salsas are available for serious chileros — chili lovers. The meat is juicy and succulent, the smoky grilled aroma lingering until you take the next bite. Washed down with an ice-cold horchata or agua de Jamaica, these morsels are simply divine. But I live in the Art Deco district of La Condesa, a couple of miles from Mexico City’s old center. When I need a quick lunch I stroll over to El Tizoncito, a much-loved open-air taquería surrounded by high stools. 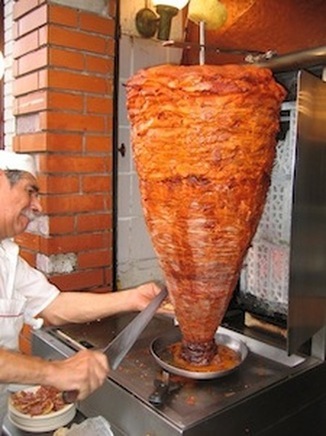 Like many places, it claims to have “invented” the taco al pastor. As the large, conical pastor roasts slowly in front of the red-hot vertical grill, curls of aromatic, heady, meaty smoke waft lazily toward the hungry diners. 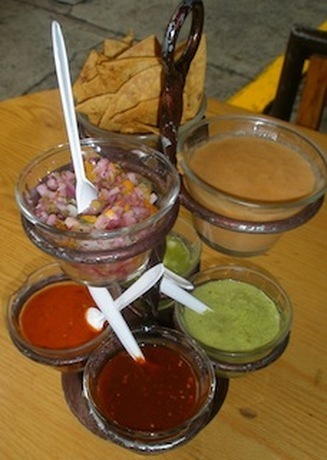 Fresh-fried tortilla chips are delivered with the salsa stand and its five little pots of colorful sauces in varying shades of bright greens and brick reds. Another pot contains warm bean purée. The pastorero works swiftly, slicing off the hottest, crustiest pieces from the mound along with a bit of bronzed pineapple and a spoonful of drippings. He quickly sprinkles on diced sweet white onion and dusts the top of the taco with finely chopped cilantro. The plate of three open tacos is whisked to my table. Only three at a time, that’s the limit. I think about adding more salsa, lime — but, no — why gild the lily? I pick up a taco, folding up the sides with thumb and index finger, closing the end with the forefinger. With the first bite, I immediately get that flavor of roast pork, the perfume of cilantro, the bite of the onion, subtle bitter aroma of chili, and the sweet heady piña. One more small bite and the first taco’s gone. The second and third follow. I hail the waiter and ask for more. I think about the bittersweet experience of downing a dozen of the best oysters, that feeling of mourning you enter when you’re on number 12. It’s always over too soon. This one, in the entrance to a hideous electronics mall, may not be the best but it's certainly the biggest. You can pick up a portable phone cheap while you're at it. Try the earlier, Middle Eastern version here. This place is out of most people's way but legendary. See my video of a couple of years back! You have to try out "Los chavos", near Tasqueña. Erasmo Castellanos Quinto #251. Nothing beats their agua de horchata too. We haven't been to el huequito on Ayuntamiento, but the best pastor my wife and I have tried here so far is in Las Brasas (written up in chilango magazine a year or two ago), on Av. Centenario near Mixcoac. Very worth the trip out there. El Greco is brutal!!! They are delicious, but its not the traditional 'taco al pastor', it is a mix between this technique and arab kebabs. Amazing! The avocado sauce is to die for!